Opening Act: Filibuster gone bust. Democratic Sens. 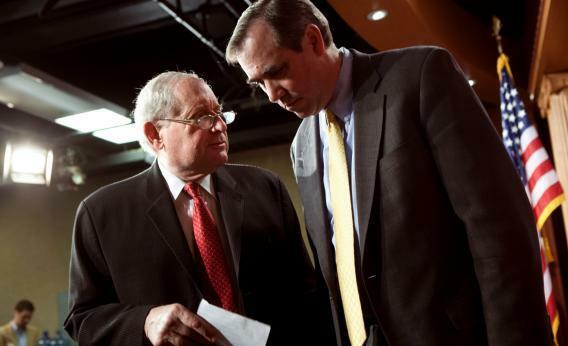 Carl Levin, left, and Jeff Merkley, seen here on May 10, 2010, are looking to rein in the filibuster. We’ve lived through so many false starts of filibuster reform—end of 2010, start of 2013, a few other times this year. Niels Lesniewski previews the next-next-next filibuster battle. While what may be debated behind closed doors at a Thursday Democratic caucus lunch seems pretty narrow, it may be tough to unring the bell if a “nuclear option” is in fact deployed on the floor. Under such a procedural move, a simple majority would assert the ability to change rules and procedures without the two-thirds vote needed to overcome a filibuster of a formal rules changes. Pennsylvania has a Democrat attorney general for the first time in years, and she won’t defend the state’s gay marriage ban in court. Dana Milbank pulls the choicest quotes from the House hearing on the outrage of the Obamacare mandate delay. “We see this as definitely something that leans toward socialism,” proclaimed Rep. Devin Nunes (R-Calif.). President Obama was called a dictator and a socialist for passing Obamacare. Now he’s a dictator and a socialist for postponing it? Evan McMorris-Santoro talks to a gun control activist and Virginia Tech shooting survivor who is nonplussed to see a photo of him used in an ad for a target practice dummy.